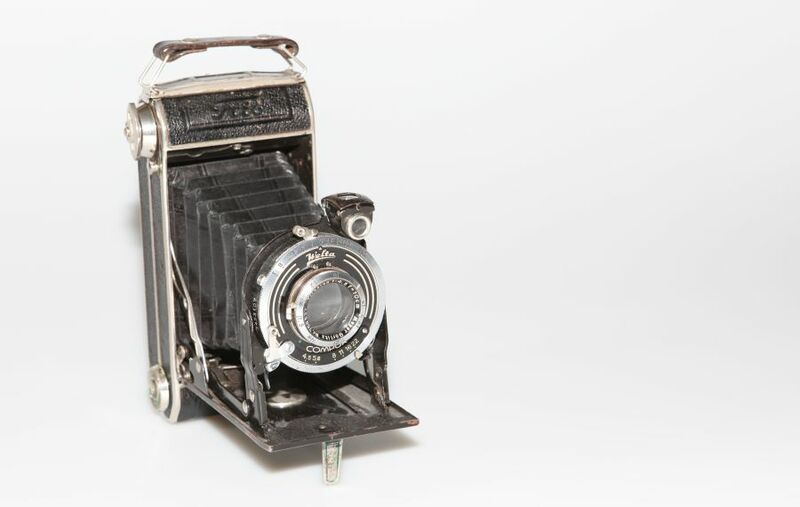 Every camera needs an optic element, thus an objective - compact cameras already have it built in, while it can be flexibly changed on SLR cameras. There is no perfect objective, which delievers optimal results in every case. That is why the flexible changing on a SLR camera is an advantage to achieve high quality photos. No matter what camera type you look at, the basic principal is the same and the variety of possible advantages and problems are related. Following I will speak about objectives - also built in objectives of compact cameras. 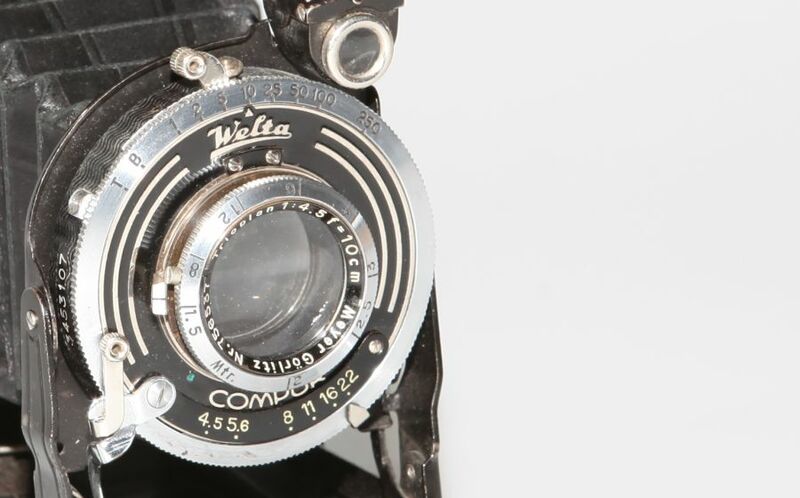 Light intensity and f-number of the antique photo camera "Welta Compur"
This objective also has a f-number of f/4,5 - the smaller the value, the more light can fall onto the film viz. image sensor. Keeping the age of the Welta Compur in mind it is already a good value. The more light intense an objective is, the more degrees of freedom a photographer has. The specification on the objective states the biggest possible aperture, what is close to the maximum light intensity of the objective. On the picture you can see, how the aperture of the old camera can be manipulated by using the lower switch. On that camera, the arrow is close to the aperture value f/22 - possible are aperture values from f/4,5 to f/22. In the chapter about aperture I shed a light on the interaction between aperture and time. The second important value is the focal length respectively on zoom lenses the possible area including the appropriate light intensity. The objective seen in the picture has a fixed focal length of 50 mm with a luminosity of f/1,4 (The value on the left). The following objective has a zoom area between 24 to 70 mm with a constant luminosity of f/2,8. The constant f-number has the advantage, that the set aperture value of f/2,8 is always given, no matter if you are using the 24 mm or 70 mm. Compared to that the following objective has a zoom area between 18 mm and 250 mm and a f-number of f/3,5 to f/6,3. That means, that it is possible to use an aperture of f/3,5 when using an aperture of 18 mm, but when you start to zoom, the inital aperture value grows significantly worse. When using 140 mm then the inital aperture value is f/6,3. Quality has its price - especially when picking up photography in your leisure time prices of 1000 $; or more only for an objective do hurt. And it can be even more expensive. 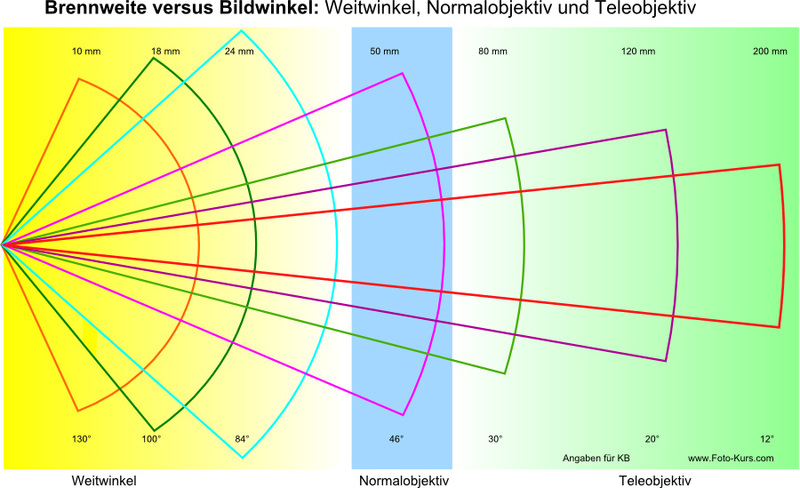 The normal lens is similar to the common human sight - that the reason why it is called like that. If the angle of view is wide, then we speak of a wide-angle lens - for such an angle of view a human has to turn is head viz. move his eyes. A telephoto lens can display objects enhanced. Normaly, there are no angle of view values displayed on the camera, because it is hidden into the focal length value of the objective. 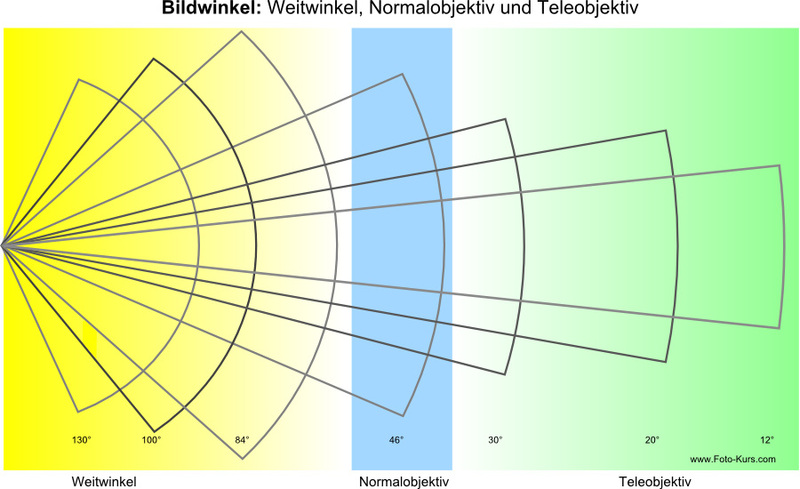 The given value of focal length has its origin in the analogue time of photography. Back then the films were standardized to 35 mm film - mostly in the full-frame format with its usual 24 x 36 mm. That means the focal length was identical to the angle of view. The following figure is based on the 35 mm film format - here I try to show the focal length proportional to the angle of view. With the technical development of digital photography the numbers of the various sizes of image sensors increased - respectively, there are the full-frame sensor (which measures are identical to the 35 mm film), the APC-C, Four Thirds 4/3 and some others. The angle of view does not change - it is constant for all different formats. But, depending on the size of the image sensor an objective with an angle of view of 46° then 50 mm, or through the viewfinder, which uses a small sensor, are 80 mm more likely. Talking about "focal length extension" or "lens magnification" (which you will both often read) is wrong. It feels like an extension of the focal length, because the image is displayed "bigger" - in reality it is only a section enlargement. For example, when using a 50 mm objective on a camera with an APS-C sensor and the merke! Ausschnitt of a 80mm-objective - but not the benefits of a 80 mm objective. The 80 mm objective has the advantage in portrait photography is that it has a cushion-shaped distortion, this has the effect that a face seems smaller on the picture. But more about it in the chapter about portrait photography. Summed up: the numbers on an objective state the focal length - which we should always treat carefully with the format factor (Take a look at the chapter about the image sensor) of the used camera. There are a lot of objectives with a fixed focal length - that means: with only one built-in value. The advantage is that the objective with a fixed focal length is optimized and produces the best-possible quality. A zoom lenson the other hand is one which offers variable focal lengths. There are pure wide angle zoom lenses - which offer, for example, a bandwidth from 10 to 24 mm. There are also pure reine zoom telephoto lenses, for example, with a range of 70 to 200mm. And there are zoom lenses, which enclose all areas, for instance 18-250 mm. But this additional degree of freedom is payed for with a decrease in image quality. Keep your hands of it - different cameras (especially in the consumer-area) offer a zoom, which is purely calculated digital. The photo gets calculated bigger internally. That way, a high quality can simply not exist - where should it come from - it only gets calculated and interpolated. Do yourself a favor and only work with a real optical zoom and deactivate the digital zoom. If your camera only has a digital zoom then take a closer look into the quality of the pictures. Make one picture with zoom and one without of the same section (yes, that includes moving closer towards the subject of your photo) The higher quality of the picture without the digital zoom should be clearly visible on a appropriate monitor screen. No matter what camera type you look at, they basic principal is the same and the variety of possible advantages and problems are related. The more light intense an objective is, the more degrees of freedom a photographer has. The specification on the objective states the biggest possible aperture, what is close to the maximum light intensity of the objective. On the picture you can see, how the aperture of the old camera can be manipulated by using the lower switch. On that camera the arrow is close to the aperture value f/22 - possible are aperture values from f/4,5 to f/22. Compared to that the following objective has a zoom area between 18 mm and 250 mm and a f-number of f/3,5 to f/6,3. That means, that it is possible to use an aperture of f/3,5 when using a aperture of 18 mm, but when you start to zoom, the inital aperture value grows significantly worse. When using 140 mm then the inital aperture value is f/6,3. With the technical development of digital photography the numbers of the various sizes of image sensors increased - respectively, there are the full-frame sensor (which measures are identical to the 35 mm film), the APC-C, Four Thirs 4/3 and some others. For example, with a 50 mm lens on a camera with an APS-C sensor, you have the aperture of an 80 mm lens. But not the advantages of an 80 mm lens. The 80 mm lens has the advantage in portrait photography that it has a cushion-shaped distortion, making faces look slimmer. Read more about this in the chapter on portrait photography.